She smiles when answering questions. You could ask why – since most of her answers shock the interviewer. Even standing near a genocide memorial site, she keeps a calm face – visibly not over taken by despair. She, however, carries a strong heart of resilience. In her interviews, she leaves everyone in total shock, because of the unimaginable scene of how she survived the genocide against the Tutsi. Welcome to the world of Fébronie Dusangiyihirwe – a 27-year-old who, miraculously, stands as a survivor today. Whenever you place a recorder before Dusangiyihirwe for an interview, her story of surviving the genocide directly takes you to the biblical story of how Daniel survived in the lion’s den. Chapter 6 in the Book of Daniel tells how he was raised to high office by his royal master Darius the Mede, but jealous rivals trick Darius into issuing a decree which condemns Daniel to death. Hoping for Daniel’s deliverance, but unable to save him, the king had him cast into the den of lions. Well, Daniel’s enemies could have had a reason. He had been raised to high office. But for Fébronie Dusangiyihirwe, her enemies were beyond imagination. She was dumped in a river at the age of 2 – signaling the level of criminality by her enemies. 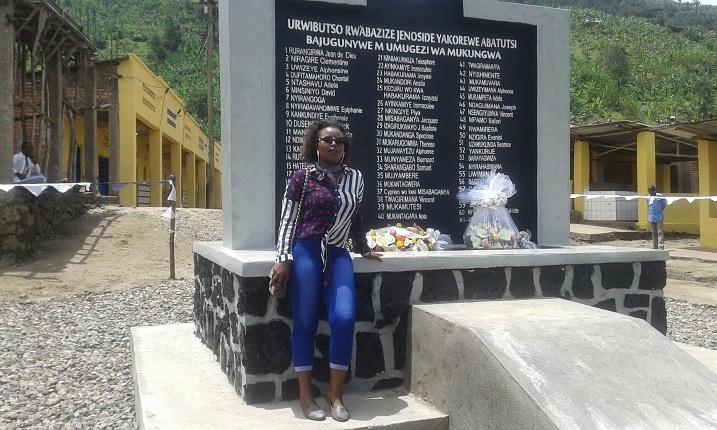 Deep in Mugunga sector of Gakenke district in Northern Rwanda, little Fébronie Dusangiyihirwe was born – two years before the horrific genocide that claimed over 1 million lives. When Genocide erupted, Fébronie Dusangiyihirwe’s mother was killed on spot. Dusangiyihirwe spoke to Kigali Today and narrated a long and miraculous journey of how she survived, as told by her father whom they survived together. “When my mother was killed, an unknown woman carried me in the back and started running for safety,” narrates Dusangiyihirwe. Some miles away at Mukungwa River, says Dusangiyihirwe, Interahamwe militia ambushed the woman. “They dumped us in the River but luckily enough, meandering water threw us on the River bank. We were still breathing,” Dusangiyihirwe told Kigali Today. However, this first attempt was far from over. The militias kept watching at the River shores. “When they realized that we were breathing, they dumped us again but the River kept its promise to save us. We were again pushed by the running water on its bank,” Dusangiyihirwe said. Again and again, Interahamwe militia kept their mission tight – whether Dusangiyihirwe and her foster mother breathed their last. “When they realized that God had not given up on us, they dumped us for the third time. But this time, they thought we were completely dead. They were wrong,” Dusangiyihirwe told narrated. Placed at the River bank for the third time, Dusangiyihirwe and her foster mother were rescued by Rwanda Patriotic Army (RPA). “We both survived but what hurts me most is how my foster mother later died of a natural disease,” said Dusangiyihirwe. Twenty-five years after the genocide, Dusangiyihirwe has a lot to give back to God, the Rwanda Patriotic Army and the country in general. Currently a University graduate, Dusangiyihirwe vows to work had and contribute to her country. “I have started venturing into business. This is the only thing I think will help me give back to my country,” Dusangiyihirwe said with a smile on her face.